For thousands of years people stayed in constant motion just to survive. We humans are still built to move. But in a time when many of us work sitting down all day, we might need some help! 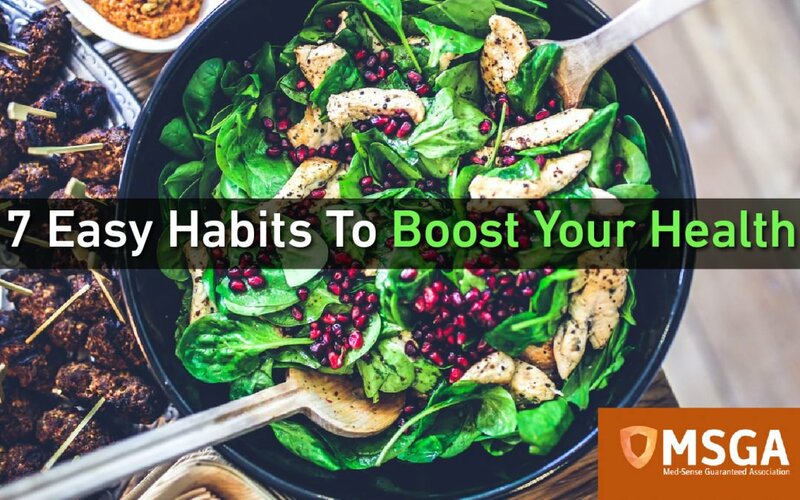 Here are 7 healthy habits guaranteed to put some spring back in your step and boost your health. Checking with your physician is always a good idea before starting new physical activities. Work your heart. Remember: We were born to move. Take the stairs instead of the elevator, if at all possible. Folks who visit between offices in multi-floor buildings can sneak enough exercise in to call it a workout. Some mountaineers train for the mountains this way. But you don’t need to climb Mt. Everest to feel the benefits! Life is movement. Walking might be the greatest natural exercise there is. Walk to the store. Find a big mall and walk through it. Try doing your own yardwork if you don’t already. Make it a game to find opportunities to walk. Treadmills at the gym are okay too, but one of the great fringe benefits of walking is enjoying the scenery. Riding a bike is another great way to travel and get exercise at the same time! Is work nearby? Ride to work. How about the grocery store? Put a basket or saddle bags on your bike, and use it for your light shopping. Almost all stores have bike racks. Back problems are among the most common modern health issues. Sitting all day can be as bad for your health as some diseases. Movement is key. These desks allow you to sit for a while if you like then stand for a while. Standing using good posture alleviates many of the problems prolonged sitting causes. Odds are you watch television. Use that time to make some fitness gains. Ride a stationary bike, or get down on the floor and exercise. Sit-ups, pushups, ab crunches, and all kinds of other exercises and stretches can be tucked into TV time! You’d be amazed how much better nutrition can boost your health. It can also help keep your weight in the proper range. You don’t have to make radical changes in the beginning. Cut down on fast food. Eat fish or chicken more often, instead of beef. Increase your vegetable intake and ease up on desserts. Take a good multivitamin. Connect with people. According to the Mayo Clinic, positive thinking can increase life span, guard against disease, and fight depression. People who stay involved in positive social interactions tend to live longer and healthier. We’re often inclined to worry and focus on the negative. So become aware when those negative thoughts occur and think positive instead! It doesn’t cost a thing. There you have it: 7 easy habits to boost your health. Once you start looking you’ll find others. Because the more of these you try, the better you’ll feel!